Home / Posts tagged "Cold Meat Industry"
Comments Off on Cold Meat Industry – 30 Years Anniversary live! 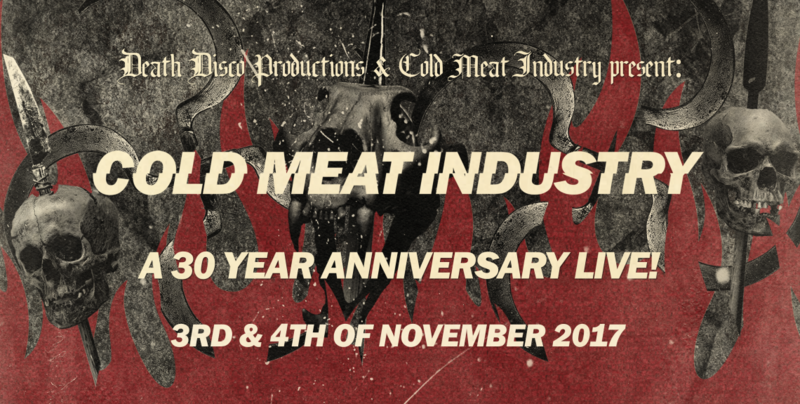 Cold Meat Industry – 30 Years Anniversary live! If you’ve ever been into genres like Dark Ambient, Neofolk, Power Electronics or Martial Industrial you must have surely heard of the legendary label Cold Meat Industry. Founded by Roger Karmanik in 1987, it released music made by himself or his friends. The label grew pretty fast into a respected name and later on to become a genre of its own, an untouchable giant amongst the industrial subgenres. A lot of the signed acts by the label are still widely celebrated in Europe, playing for full houses but, ironically, in Sweden and other Scandinavian countries we have rarely seen more than a few constellations from the label since its start. We have now gathered more acts signed to the famed Cold Meat Industry than any other festival has ever managed to. Together with Roger Karmanik we intend to make this event the ultimate Cold Meat Industry party and celebrate 30 years since the foundation of this piller for the industrial subgenres. This will be a gathering that will never happen again, nowhere, period! Earlier acts plus almost all the big performers from the label have been brough together: some rarely play live, other have never played at all or some were even put to rest a long time ago. Without further a do, Death Disco Productions together with Cold Meat Industry proudly present: A 30 year anniversary live!